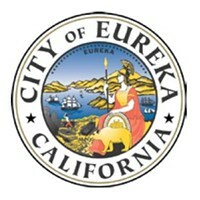 The Eureka police officer who fatally shot Thomas “Tommy” McClain testified Tuesday that he stood by his actions and believed he had no choice but to shoot when the 22-year-old reached for what he believed was a gun in his waistband. “I was scared that the gun was going to come out and he was going to be able to shoot either myself or my partners,” Officer Steven Linfoot said after briefly struggling to regain his composure during a second day on the stand at federal trial in the wrongful death lawsuit brought by McClain’s parents. Other options from a Taser — which he was not certified to use at the time — to a baton to pepper spray were not viable alternatives with a firearm at play and considering his distance from McClain, Linfoot said under questioning from attorney Nancy Delaney, who is representing the city. Linfoot made similar statements while fielding questions about his actions from McClain’s parents’ attorney, Dale Galipo. 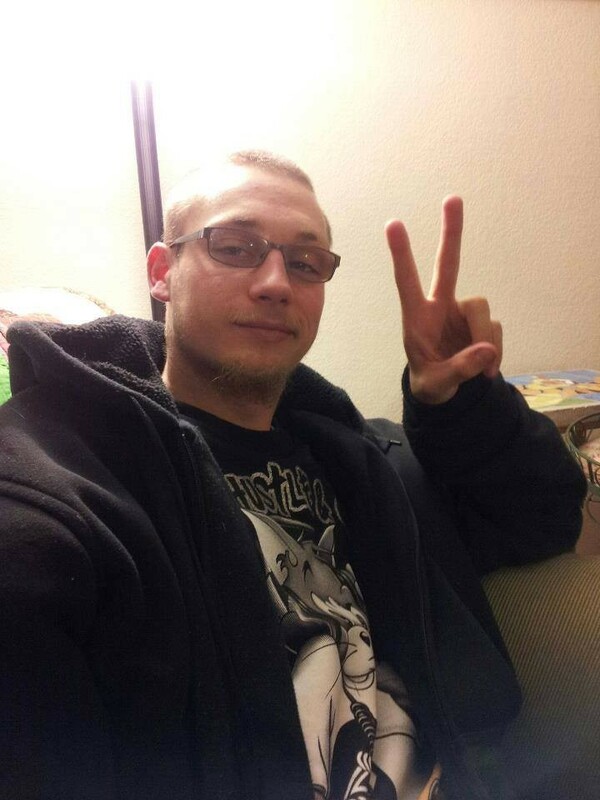 McClain was killed on Sept. 17, 2014, after being hit by three of the seven rounds Linfoot fired. The weapon officers had spotted in his waistband turned out to be an unloaded BB gun that was a realistic replica of a handgun. 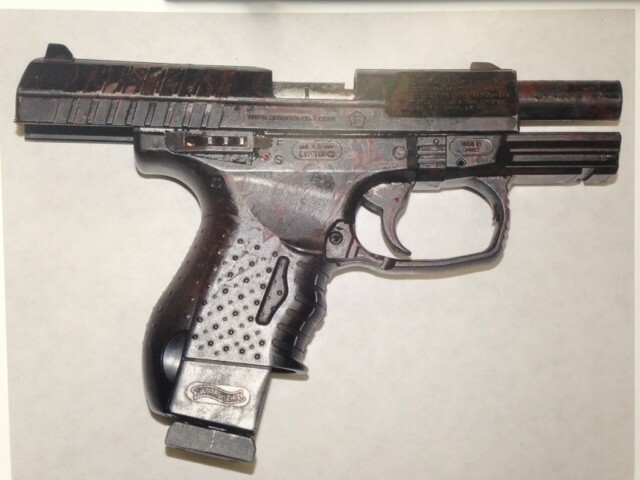 A police photograph of the replica handgun reportedly found on McClain. No criminal charges were brought in the shooting following a multi-agency investigation. Of the trio of officers who had their guns trained on McClain after they became concerned about his actions while conducting an unrelated surveillance effort on a neighboring townhouse, Linfoot was the only one to fire. McClain’s family alleges he was killed trying to comply with a series of conflicting commands during a brief confrontation in the front yard of his Allard Avenue home, where he lived with this cousin. Police say he was shot while reaching for the replica gun in waistband following repeated commands to keep his arms in the air. Capt. Brian Stephens, at the time a sergeant who was overseeing the surveillance effort, testified he was readying to pull his own trigger until Linfoot shot first. 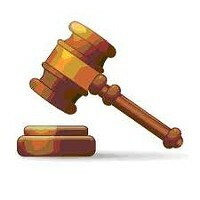 “I was preparing and mentally said to myself, ‘I’m going to have to shoot him because of what he did,” Stephens said. He said he came to the scene after hearing the “urgency” in the voice of one of the surveillance officers who had become concerned after seeing McClain fiddling with what they thought might be gun while seeming to be prepping for a fight following a confrontation with another man on the street that evening. The two other officers at the surveillance scene, Ryan McElroy and Stanley Harkness, testified that they had feared for Stephens’ safety after watching McClain’s actions when Linfoot drove down the street in an attempt to get McClain to go back inside for the night. Instead they said they watched him pull out and “rack” a gun before putting it back in his waistband. The first to contact McClain directly, Stephens, said he pulled up his car, trained his spotlight at McClain and directed him to put his hands up and come down to the street to talk. That, he said, started a “back and forth” dialogue, with McClain asking what he had done and saying Stephens didn’t have to right to search him. Stephens said that raised a “red flag” because he hadn’t mentioned the gun, which he then observed when McClain’s shirt shifted as he walked down the lawn with his hands raised. Stephens said he told McClain at some point that he saw the gun and directed him not to touch it. Questioned by Galipo on whether he was saying he had been prepared to shoot just to back up Linfoot’s action, Stephens denied the assertion. The grainy footage from the dash cam in Linfoot’s police car that captured audio of McClain’s last seconds was also played and replayed for jurors as his family members sobbed in the front row before being directed out of the courtroom by Galipo. They later came back in. Several jurors also wiped away tears. 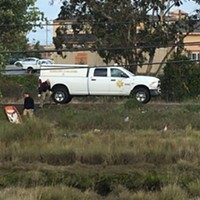 A police photo of the scene of the fatal shooting. 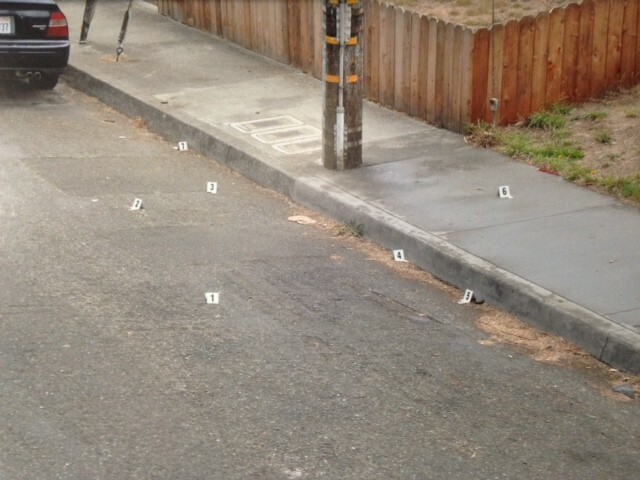 Numbered white evidence markers show the locations of where California Department of Justice investigators found seven shell casings from officer Steven Linfoot's gun. A series of shouts can be heard on the tape before a rapid succession of gun shots followed by a woman’s screams. Linfoot continued to say he didn’t recall yelling out “get down” in the instant before he fired while other officers told McClain to keep his hands up. But Linfoot said he recognized the voice on the video as his own. The words, he said, sounded like an interrupted command. When questioned by Galipo on whether McClain might have lowered his hands attempting to comply with the order, Linfoot said there didn’t appear to be time — that McClain didn’t make any moments like bending a knee to indicate that’s what he was doing, and that there was never an order made to get down on the ground. “That’s what I did,” he said.